Bunion Sleeves work well for many situations. They can be worn as an insert in any shoe easily and comfortably. Exclusive gel conforms, protects and soothes tender bunion area and prevents blisters and rubbing from footwear. We suggest to use the sleeve under snug fitting socks. Sport Shield Spacer is the one with two stretchy loops that go around your big toe and second toe. This helps prevent rotation of the shield spacer while you're doing physical exercises, like running, dancing, etc. Standard Spacer has one loop and no shield. It helps realign the big toe when you don't want a bulky shield on your foot. This can be worn with or without shoes for every day use to relieve bunion pain. The big toe strap is a great tool to realign and relieve discomfort from bunion hammer toes. Helps to restore the natural aligment of your feet. 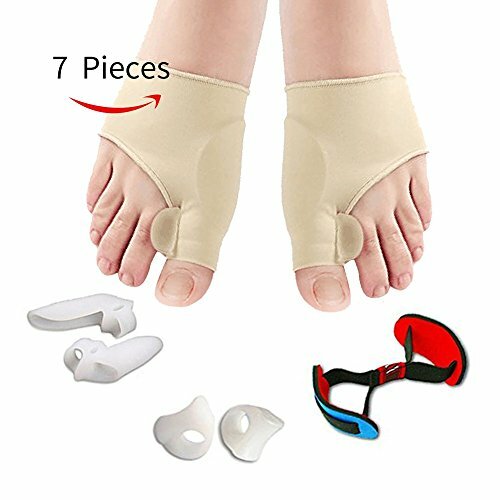 FAST PAIN RELIEF - Relieve your bunion pain,reduce friction for your toes,help you Separate, straighten, stretch and align your toes, Like a podiatrist in your home. SATISFACTION GUARANTEED! This will be your best Bunion Corrector & Bunion Relief Kit ever. Amazon's guarantee is great, but ours is even better! If you have any questions about this product by SOUREPOSE, contact us by completing and submitting the form below. If you are looking for a specif part number, please include it with your message.